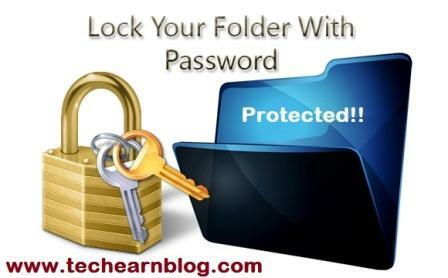 Do you want to lock and password protect your important folders. It is very easy to do this will take less than a minute. Unfortunately, Windows Vista, Windows 7, and Windows 8 do not provide any features for password protecting files or folders. You need to use a third-party software program to accomplish this. So, Follow the steps in this guide to make sure that your personal files are safe from others. >>Reliance Jio 4G Plans for Prime & Non Prime Users. Step 1: First download WinRAR software to your Computer or Laptop. Step 2: After download, Install WinRAR Software into your Computer or Laptop. Step 3: Now Select your Folder which you want make password protected. Step 4: Right Click on Folder and Select Add to Archive Option. Step 5: In next, Click on Set password option. Step 6: Set your password for make your folder password protected. Step 7: Click ok option. It will create new RAR Folders. Step 8: Now Try to open your password protected folders. Step 9: It will ask password for open files. Step 10: If you enter wrong password than it will display error and your files will not open. Step 11: When you enter true password than your files will open. >> Top 7 Best Free Online Games - Play Today!. >>Trick to Get Free Avast Antivirus 1 Year License Key.